David "Honeyboy" Edwards was born June 28, 1915 in Shaw, Mississippi, and passed away on August 29, 2011 at his home in Chicago, Illinois. 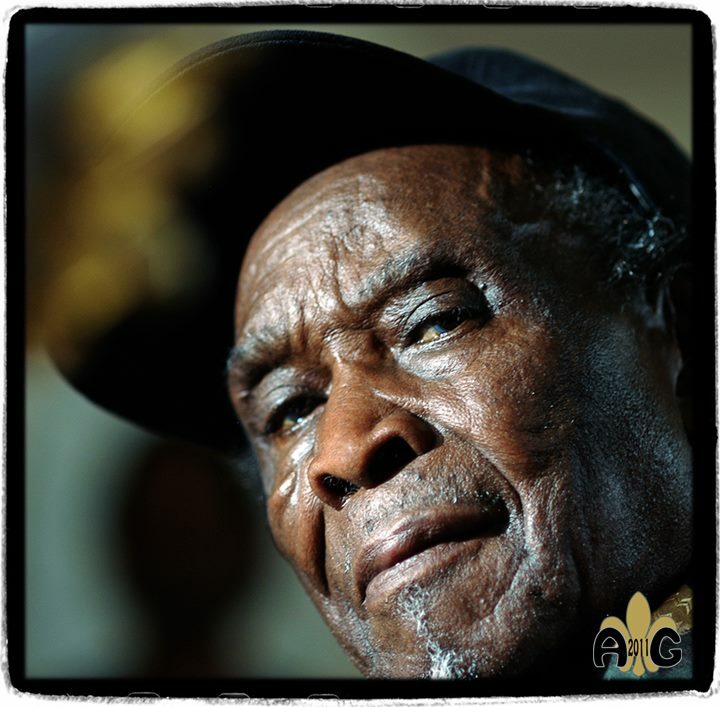 Honeyboy is one of the last living links to Robert Johnson, and one of the last original acoustic Delta blues players. He is a living legend, and his story is truly part of history. He is the real deal. Honeyboy was a part of many of the seminal moments of the blues. As Honeyboy writes in "The World Don't Own Me Nothing", "...it was in '29 when Tommy Johnson come down from Crystal Springs, Mississippi. He was just a little guy, tan colored, easy-going; but he drank a whole lot. At nighttime, we'd go there and listen to Tommy Johnson play." Honeyboy continues, " Listening to Tommy, that's when I really learned something about how to play guitar." Honeyboy's life has been intertwined with almost every major blues legend, including Robert Johnson, Charlie Patton, Big Joe Williams, Rice "Sonny Boy Williamson" Miller, Howlin' Wolf, Peetie Wheatstraw, Sunnyland Slim, Lightnin' Hopkins, Big Walter, Little Walter, Magic Sam, Muddy Waters, and ... well, let's just say the list goes on darn near forever! In 1942, Alan Lomax recorded Honeyboy in Clarksdale, Mississippi for the Library of Congress. He recorded a total of fifteen sides of Honeyboy's music. Honeyboy didn't record again commercially until 1951, when he recorded "Who May Your Regular Be" for Arc Records. Honeyboy also cut "Build A Cave" as 'Mr. Honey' for Artist. Moving to Chicago in the early fifties, Honeyboy played small clubs and street corners with Floyd Jones, Johnny Temple, and Kansas City Red.In 1953, Honeyboy recorded several songs for Chess that remained un-issued until "Drop Down Mama" was included in an anthology release. In 1972, Honeyboy met Michael Frank, and the two soon became fast friends. In 1976, they hit the North Side Blues scene as The Honeyboy Edwards Blues Band, as well as performing as a duo on occasion. Michael founded Earwig Records, and in 1979 Honeyboy and his friends Sunnyland Slim, Kansas City Red, Floyd Jones, and Big Walter Horton recorded "Old Friends". Honeyboy's early Library of Congress performances and more recent recordings were combined on "Delta Bluesman", released by Earwig in 1992. Honeyboy has written several blues hits, including "Long Tall Woman Blues", "Gamblin Man" and "Just Like Jesse James." His release, Roamin and Ramblin, on the Earwig Music label, featured Honeyboy's old school guitar and vocals - fresh takes on old gems and first time release of historic recordings. New 2007 sessions with harmonica greats Bobby Rush, Billy Branch and Johnny "Yard Dog" Jones, previously unreleased 1975 studio recordings of Honeyboy and Big Walter Horton, and circa 1976 concert tracks -- solo and with Sugar Blue. Michael Frank, Paul Kaye, Rick Sherry and Kenny Smith also play on the album on various tracks. Honeyboy and Bobby Rush also tell some short blues tales. Honeyboy was awarded a Grammy Award in 2008 for Best Traditional Blues Album, and in 2010 was warded a Grammy for Lifetime Achievement.